WEDNESDAY, Aug. 31, 2016 (HealthDay News) -- Intensive care patients have a significant loss of helpful gut bacteria within days of entering the hospital, a new study finds. These bacteria help keep people well. Losing them puts patients at risk for hospital-acquired infections that may lead to sepsis, organ failure and even death, according to the researchers. 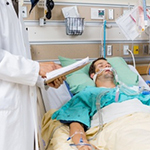 For the study, the investigators analyzed gut bacteria from 115 intensive care unit (ICU) patients at four hospitals in the United States and Canada. Measurements were taken 48 hours after admission and after either 10 days in the ICU or leaving the hospital. Compared with healthy people, the ICU patients had lower levels of helpful bacteria and higher levels of potentially harmful bacteria, the findings showed. "The results were what we feared them to be. We saw a massive depletion of normal, health-promoting species," study leader Dr. Paul Wischmeyer said in a news release from the American Society for Microbiology. Wischmeyer, an anesthesiologist at the University of Colorado School of Medicine, is moving to Duke University in the fall. The researchers noted that they were surprised by how quickly gut bacteria populations changed in some ICU patients. "We saw the rapid rise of organisms clearly associated with disease. In some cases, those organisms became 95 percent of the entire gut flora -- all made up of one pathogenic taxa -- within days of admission to the ICU. That was really striking," Wischmeyer said. Antibiotics and other drugs used in the ICU, along with poor nutrition, can reduce healthy bacteria in the gut, he explained. Learning more about the effect of these changes could lead to treatments to restore bacterial balance and reduce infection risks, Wischmeyer suggested. The study was published Aug. 31 in the journal mSphere.